Chlorhexidine base is barely soluble in water, but it is available in salt forms: chlorhexidine diacetate (CHA), chlorhexidine dihydrochloride, chlorhexidine digluconate (bigluconate), chlorhexidine gluconate and chlorhexidine phosphate. 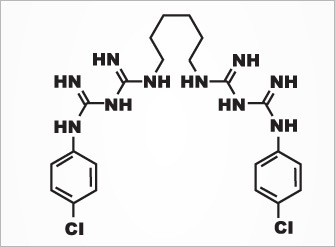 These salts forms chlorhexidine solutions that are colorless, odorless and have a bitter taste. In healthcare or commercial use, chlorhexidine digluconate is one of the more commonly used forms of the chlorhexidine salts.